This weekend always feels a little holy and a bit hollowed out at the same time. It’s the knowing and the not knowing. My sweet baby would be four years old now, on the cusp of leaving toddlerhood altogether. It’s the realization that life was never the same. It is the remembrance of how life nearly slipped from my fingers. And yet, with each of turn of the sun, the day becomes more sweet and less bitter. The raw gaping wound is now soft and white about the edges, time’s stamp. I can breathe now. 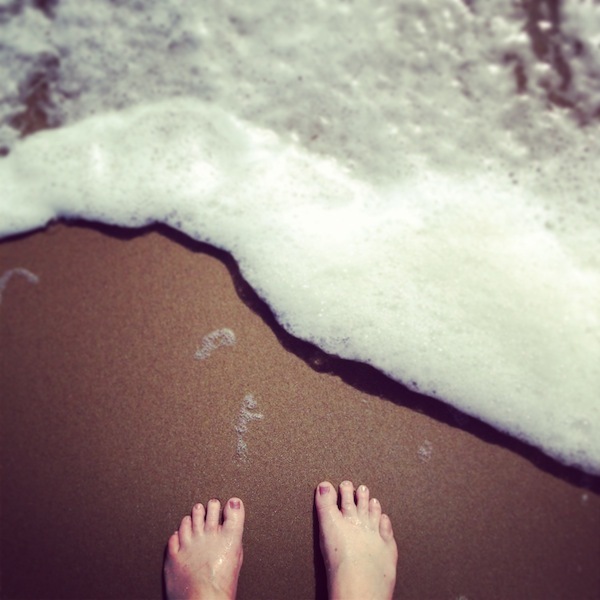 The waves crash over my feet and not over my head. A peaceful place. Its become my touchstone in the year…my way of turning my eyes to the horizon and heavens…fresh clarity. Sometimes it amazes me how much I’ve forgotten how I nearly died; and yet other days it hits me fresh, gratitude coursing through my veins that I have this moment of laughter with a freshly bathed kiddo on my lap or that beautiful sunset or those flowers on the table. When it first happened everything seemed bathed with technicolor, almost so beautiful and so clear that it hurt to look at it. That feeling fades over time, and yet it doesn’t. The veil slips for a moment and suddenly you are caught breathless by the miracle of life all around you. It always happens on this weekend. Always I see the mosaic jewel-toned light of day and the twinkle stars of night and I remember. How the Father of all lights bent close and held me. How love lifted me from the water. The skillful hands of my surgeon and friend. The prayers that echo still. Although the grief never leaves entirely, it is a gentle friend now. Another year given to me, another year to pray, to praise, to love. It is enough. It is more than enough. I was asked to speak to a small number of people this morning. People whom I deeply respected, people whom have had a profound affect on my life these last six months. I felt very, very, inadequate, and very, very nervous. You see, the question they were wrestling with was: "Does God care? How do we, as Christians, as believers, make sense of the realities that happen to us and around us?" How many, many, many times, have I found myself asking that question these last months? "God? Why?" I have struggled mightily with the inky darkness, and some days, it feels like the darkness will overcome. Grief and sorrow are so unusual in their expressions- so different for each person, but yet so universal in experience. Any mama who has lost a child knows the profound loss another mama is experiencing, but how the loss effects each mama can be strikingly different. And sorrow moves about like a shadow, catching you unawares at the most normal of times. I could hear a baby crying a thousand times and it not affect- but then one day in the middle of an errand filled busy day, a newborn crying in a grocery store will be like knives through my heart, taking my breath away and causing the tears to fall. Sometimes, you just don't know when its going to hit- I tend to think it never quite goes away. I could only tell these people what I knew, what I had experienced. In a lot of ways, it was hard to quantify. How to explain the black nights that were so deeply dark that they were almost navy blue? How to explain how many times I have doubted? How many times I have struggled with both anger and inadequacy? How many times I just wanted to say, "God, this hurts so very much, and why can't You make it better? " As if to question His wisdom, His competency. Oh, how I've wrestled with it, so much. I didn't spend much time talking about this wrestling match during my few minutes. I just couldn't look in the face of these people and say that. Funny how God works…but I'll get to that in a moment. What I did share was a condensed version of what I've said here on the blog. And how I've had to make this conscious choice to get out of bed each day and cling to the Light and turn back the darkness. Because, it would be so easy, so easy, to just slip off the edge, into the abyss. But I cannot. God has shown Himself so clearly in the pain that I cannot mistake Him. It's like seeing a silhouette. I can't see Him in His Glory, but I see around the edges, where the Light peeks through, and it's those glimmers of light that I cling to. Yes, nothing is certain right now. James is entering the third month of no job and seemingly no prospects, the pain of loss is still with me, and the normal every day realities of being a momma to four accident prone kids who test my patience on a daily, sometimes hourly basis. Sometimes, none of it makes sense! But yet, in all of that, God is faithful. Each month, the money stretches, and God provides in the most unique of ways. I have been given companions for the journey- women who've faced the same loss as I have in nearly the same week, and I feel so much less alone knowing they are walking similar paths. Each provision, grace from a loving God who knows the hairs upon my head, who provides for my every need. I can honestly say that I would not have been able to see His provision had He not stripped everything away. If I hadn't nearly lost my life. I would not have had the eyes to see. I feel some days as if I am living on borrowed time. I hope I never lose that feeling, because it keeps my heart and focus in the right place. Knowing that you should have, by all rights, died- gives you this totally different view of things. Each day is a gift. Each day with my children, no matter how frustrating and bad, is a day given straight from the Father's hand, and therefore a treasure. It's true of our normal lives, yes, but oh how we forget! How often do we forget that this is just a journey towards Home, each day a step? How often do I forget, and I have not been long from my brief sojourn towards the undiscovered country? I can't wait to be able to link you to the product of this meeting- the worship service and sermon that come out of it- because just the beginning planning stages spoke so deeply into my heart and I hope that the finished product will speak powerfully into the hearts of other believers. My English and my grammar fail me, honestly…it is so weird, in a good way, to watch and hear the Spirit move. To see how It informs and guides and directs, forms prayers, words, thoughts and places it on the mouths of those willing to listen. I mean, how could these people know some of the struggles I've had? How could they have known some of the questions that have stopped me cold in the middle of the night? And they were sitting there, talking out the format of the service, what needed to be focused on, what they wanted to extend to the Body, and I swear, I felt like I was an audience of one. I don't think they realized how much they were ministering to me- they were just brainstorming. But, whoa. It was again, one of those Light peeking around the edges moments, where I could feel God's hand resting on my shoulder, and showing how much He cared. How He cared that I had been struggling, doubting, grieving, and was using these people to be His hands and feet. Using them to bind up the broken places-they were probably totally unawares of it, too. I wish I had written more of it down…just light bulb after light bulb went off in my head, all the scriptures they listed and spoke of. One of the things that just resonated with me was something that the teaching pastor said: If remembering was easy, if the struggle wasn't a struggle, then we wouldn't need communion. We wouldn't need the ordinances to remind us of His sacrifice, we wouldn't need to pray. It would be that easy. But it's not, and that's why God gave us the liturgy of communion, why He taught us to pray. Because it's the process of doing these things that calls us to remember. The hard stops. It's these things that allow us perspective that we would not otherwise have. It just sort of socked me in the gut, and reminded me to stop trying to move on my own power, and start listening. The first snow has fallen, quiet upon the mountain. It always surprises me when winter falls. Fall is so bustling with activity and newness, work and routines, gathering in, often in the rush to finish before the frosts of winter. Suddenly, it falls, always unexpected and almost like a thief. Things stop, frozen in place. The turning colors of the leaves, encased in ice, paused. It's a hard stop. A deep breath. And an acknowledgment that the seasons are turning in their endless cycle since the beginning of time. This time, the snow fell when I, too, stood paused. I was on a retreat. A quiet respite from the loud bustle of my kid filled days. Tuned in to nature, to His wonders. To the simple delights of a crackling fire in a wood stove, a good book. Good company, friends to knit with, friends to encourage. Friends to sharpen me in my walk as believer, wife, mother, friend. It's the peace of these times, the peace of the freshly fallen snow, that I carry with me into the difficult moments. It is so important to refuel, refresh, renew. It's been difficult lately. Just so much of normal life, and then other things besides. Dealing with the grief and loss I have experienced this year, the things that have occured. And standing on the mountain, watching the snow fall, I felt like I was letting it go. I would not have changed for one minute what has happened this year because it has refined me and made me stronger. I cannot help but hope. And breathe. All your circumstances are in the hand of God, so never think it strange concerning the circumstances you're in. This has been a time of 'strangeness' for many people- the markets, the scary realities of our post-modern world that seem to sit just off stage with evil eyes, waiting to pounce. I can say the same for my own family life- strange happenings, unexpected realities. I know of others for who this is true as well. I attended the wake for the mother of a distant friend, and there was a tiny two week old baby in the same room. The glorious promise of it made my chest hurt, a deep, thudding, throbbing promise. On one side of the room, Death. A life snuffed out. On the other side of the room, Life. In all its dazzling newness. At the beginning of a week, in the middle of an uncertain month, in the middle of an uncertain season, nearing the end of a wearying year, that tiny little child in the face of death reminded me Who holds the season, Who holds time. I do not hold it- no, I dare not. But I should, and will, trust in Him, and in His timing, and in His ways. His light is all I need in a darkening world.